Ahh, October. The time of the year when the air gets crisp, the leaves begin to change and Cyber Security Awareness begins! We may be bias, but we think October is the best month of the year. We live in a world that is continuously more connected than ever before. The Internet touches almost every aspects of one’s daily life, whether realized or not. Cyber Security Awareness Month (CSAM) is designed to engage and educate the public and private sector through online events and initiatives to raise awareness about the importance of cyber security, provide them with tools and resources needed to stay safe online and increase the resiliency of the Nation in the event of a cyber incident. The Government of Canada has already provided some great tools to help jump start your online security. 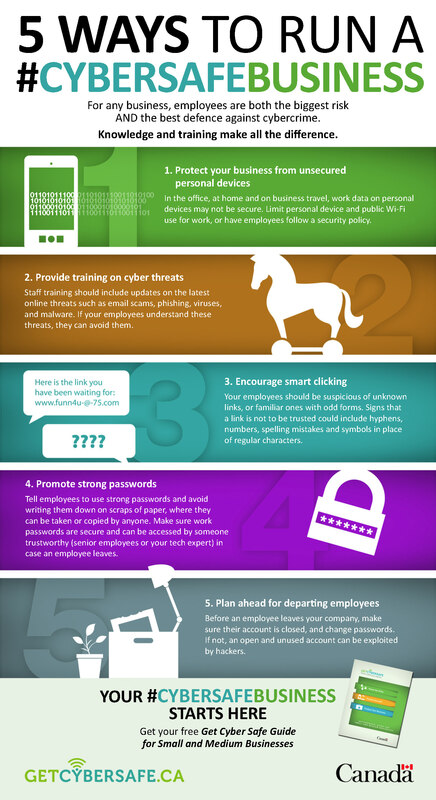 We specifically like this infographic on 5 ways to run a #CyberSafeBusiness. Check out the GetcyberSafe website for additional cybersecurity resources! And continue to watch our blog and social media because we will be posting all throughout October on our BEST security tips and tricks on how to remain bulletproof against cyber crime.